Distant Planet across the series. Distant Planet (とある星, A Certain Planet) is a stage in Super Smash Bros. Brawl. It is the first and only stage to represent the Pikmin universe in Brawl. The stage returns as a familiar stage in Super Smash Bros. for Nintendo 3DS and Super Smash Bros. Ultimate. Technically, all the fighters will be at most only a couple of inches tall when they are fighting on this stage. In Ultimate, Olimar is fought here for his unlock battle. The stage arena consists of a giant leaf with three smaller leaves above it. The small leaves sink when characters are standing on them; the heavier the character, the lower the leaf falls. When the player walks or jumps off, the leaves will spring back into position. To the left, there is a downward slope slanting into the lower blast line. As the match plays, Pellets will be seen falling from the Pellet Posies around the stage. The player can grab one of these by attacking the Posie and throw it into a nearby Onion (Pikmin ship) to get items. Just as the Onions produce more Pikmin based on the number on the pellet and if the colors correspond in the games, more items will come out the higher the number on the pellet, and more still if it is thrown in the Onion of the matching color (these are red, blue, and yellow). The pellets start out as 1, and the longer they are left to stand, they will change to 5, and then 10. Onions will land on the leaf-platforms, and can be attacked to make them flee. This may be a good tactic if a player wishes to withhold items from their enemies. Also, this planet experiences frequent torrential downpours. When things get wet, the left edge of the hill will have water sliding down, dragging players off the stage. The edge of the hill can still be grabbed during the rain effect. A Red Bulborb is to the right of the area; landing in its mouth will cause it to swallow the player. If this happens in Brawl or Smash 4, the Bulborb will drag the player off the stage, which counts as a self-destruct (unless the player is launched by a foe). In Ultimate, the Bulborb's bite causes an instant KO instead. While landing in the mouth will result in being eaten, players can grab the ledge of the Bulborb's mouth like any other ledge and walljump against the vertical part of his mouth. Furthermore, if the player is under the effect of a Starman, the Bulborb will not eat the player . Sometimes the Bulborb will cry out or yawn, or stand with its mouth gaping open. The Bulborb will wander on and off screen throughout the match. Furthermore, standing on top of the Bulborb for too long is dangerous, as the Bulborb can walk off the stage or eat characters, with both causing a self-destruct. In Super Smash Bros. for Nintendo 3DS, the Ω form is a flat version of the ground of the regular form that also extends down past the blast line. In Super Smash Bros. Ultimate, the Ω form and Battlefield form are similar to SSB4's Ω form; however, the main platform does not extend below the blast line and is resized and reshaped to match Final Destination and Battlefield, respectively. The three soft platforms of the Battlefield form are based on the leaves of the normal form. Pellet Posies in the Awakening Wood, from Pikmin 2. In both Pikmin and Pikmin 2, Captain Olimar's adventures took place on a mysterious unknown world. Specifically, this stage is most likely based on The Forest of Hope and The Awakening Wood from Pikmin and Pikmin 2, respectively. In order to create more Pikmin, Olimar must find Pellet Posies, harvest their Pellets, and return them to an Onion. The number on the Pellet indicates how many Pikmin will be spawned; returning it to an Onion of the same color produces more Pikmin than one of a different color. Harvesting Pellets works similarly in this stage; larger numbers create more items, and matching colors add even more. Red Bulborbs are the most common enemy in the Pikmin series. Its characteristics are to sleep until disturbed, then march around its territory looking for Pikmin to eat. 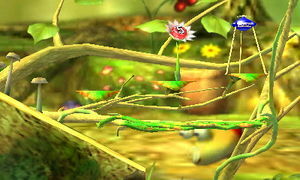 These traits are shown in Smash by the Bulborbs in the foreground and background. 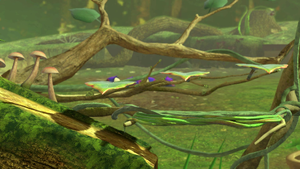 There is also a Cloaking Burrow-nit, another enemy in the Pikmin games, in the background. In Ultimate, a group of five smaller Cloaking Burrow-nits appear instead. 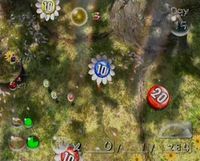 In Pikmin 2, the primary objective is to search for treasures to pay off a massive debt. These treasures mostly consist of pieces of everyday litter, but are considered valuable by Olimar's people, the Hocotatians. The soda can in the background that has the Smash symbol on it is likely a homage to these treasures. 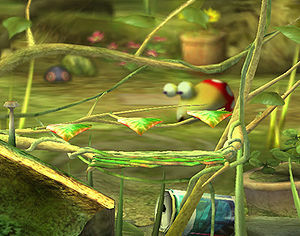 However, in Pikmin, exposed pipes and tin cans were used as signals for the location of bomb-rocks. While the identity of the planet is never outright confirmed (hence the non-descriptive name for the stage), it is very heavily implied that it is Earth, with some cutscenes showing landmasses identical to those found in real-life, and the stage's file name in Brawl being "STGEARTH". In Pikmin 3, the planet is named "PNF-404"; this name format is similar to naming conventions of exoplanets or less important planets. The letters and numbers in the name are in fact a hidden reference: 404 is the HTTP status code for Page Not Found (or perhaps Planet Not Found in this case). While Distant Planet's legality is often debated, the stage is rarely legal in tournaments, as the slope enables walkoff camping and easy KOs with high knockback attacks and chain grabs such as King Dedede's infinite chain grab with his down throw. The stage layout overall encourages light circle camping, and the bottom of the slope below the main platform is an unreasonably powerful camping position. There exists a glitch in Super Smash Bros. for Nintendo 3DS on this stage. It is not yet known how this glitch is caused, but the glitch causes an Onion to stay in place where it lands, and will not move at all, even when a player stands on a leaf, or if the leaf returns to its default position. After this glitch is executed, the Onion can be hit infinite times, and it won't go away. A Pellet and an Onion. The Bulborb about to eat the fighters. Distant Planet in for 3DS. If Sonic wears a Bunny Hood on this stage, he can run fast enough to overcome the force of the downpour on the hill, even being able to run all the way to the blast line. Furthermore, Wario is not affected by the downpour while he is on the Wario Bike. It is possible to avoid death on the Bulborb if the player jumps the same frame that it will eat their character; however, this only occurs on the top of it, with its mouth closed. Transformation Final Smashes, like the Landmasters or Giga Bowser, are not recognized as players when standing on Bulborb's mouth. The AI in Brawl does not recognize the Bulborb's gaping mouth as a hazard and will treat it like any other ledge, meaning a CPU player will often try to recover into it, causing a self-destruct after climbing up the ledge. This behavior bug occurs on all CPU difficulties, and was fixed in Smash 4. This is the only Brawl stage in SSB3DS to have a new remix. This page was last edited on April 16, 2019, at 15:00.